The Hunterdon Harmonizers performing at May 2018 Veteran's Appreciation Concert. The Harmonizers are grateful for the community’s support and wish to give back by offering free singing lessons for 6 weeks to connect people and enrich lives through singing. We exoect to return to our traditional third weekend in September for the 2019 Craft fair. However, because downtown imrovement plans, we will not be on Main Street this year. We are negotiating for several sites that will be an attractive to both our vendors and their customers. Our local businesses and town officials are working with us to make this a resounding success while the town proceeds with a very creative facelift. Stay tuned for the details on our 2019 event - our 35th year! Who are the Hunterdon Harmonizers? 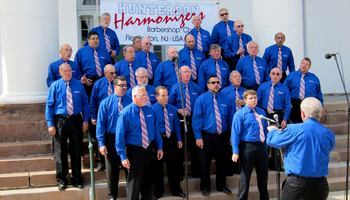 The Hunterdon Harmonizers Barbershop Chorus is an all male a cappella singing group located in Flemington, New Jersey. We are active in community and private events throughout Central New Jersey, and welcome men of all ages who share our love of music and service. This site will help you become more familiar with our chorus and activities in and around Flemington, NJ, and beyond. LOVE TO SING? BECOME A MEMBER! Were you a member of your high school chorus? Do you sing in a church choir? Would you like to share your love and appreciation of music and harmony with men who relish the chance to perform a uniquely American musical style? If so, then barbershop singing is something you may enjoy! Donald Reckenbeil, the musical director of the Hunterdon Harmonizers, was recognized at the recent Mid-Atlantic District Convention in Reading, PA. for 30 years of service as a front-line director in the Barbershop Harmony Society. Twenty years of his service has been spent as the director of the Harmonizers. Don was recognized in front of the Harmonizers on Tuesday, October 10, in our rehearsal hall at Stangl Stage. 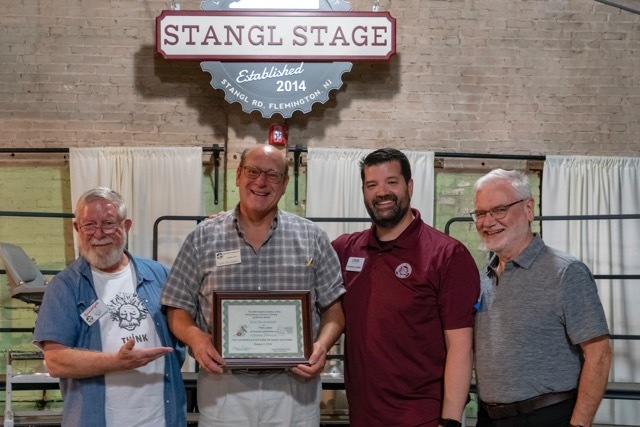 In the photo (left-to-right) are Rusty Williams (President and assistant), Don Reckenbeil (director), Christian Hunter (Immediate Past President and District Representative), and Mark Bentley (assistant). The Harmonizers are currently preparing for participation in the Flemington "Music in the Schools" program on March 19 at Reading-Fleming Intermediate School. We are also getting ready for our upcoming Barbershop Society Competition and Convention, which will be held in Allentown, Pa. on April 26 & 27. This will kick off our 2019 calendar of events, which will include the Flemington and White House Memorial Day Parades, the July 4 celebration in Lebanon, and our annual "Music Under the Stars" concert on August 1 at Deer Path Park. 2019 was a special year for the loved ones who received a Singing Valentine from the Hunterdon Harmonizers. If you missed the opportunity to do something special for that special person, be prepared when 2020 rolls around. 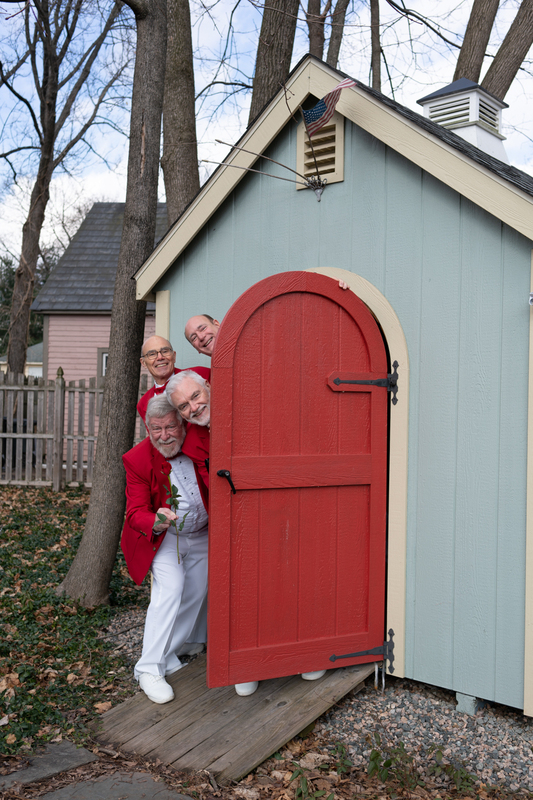 Bookmark the Hunterdon Harmonizers, or you might wind up in the doghouse! Harmony Foundation International believes in the transformative power of singing. No matter if you think you can carry a tune or not, the simple act of raising your voice in song provides so many physical, social and emotional benefits to your life. Our mission is to connect people through charitable giving to enrich lives through singing. We fulfill our mission by partnering with singing organizations and funding their programs that encourage and enhance singing experiences for all ages ensuring everyone has access to the life-changing power of singing. Our donors financially enable programs that share, nurture and perpetuate the love of singing, in particular four-part a cappella-style harmony. As proud ambassadors for philanthropy, we link those who desire to be financial catalysts for inspiration directly to our impact partners providing programs that enrich lives through singing. We grant support for scholarships that provide singing and training opportunities to middle school through college age youth, as well as singing directors and singing educators. We also grant outreach programs to develop new audiences and participants and provide opportunities for lifelong singing to people of all ages. Our donors often declare that they know they will never be able to give back as much as singing barbershop has provided to their lives but they know that no matter the size of gift, the Foundation will be able to put it to good use. Thanks to our dedicated donors, last fiscal year alone, we were able to distribute nearly $1.5M in funding that is creating ripple effects of benefits into communities across the country.